Adrian Parker is Professor in Geography at Oxford Brookes University where he leads the Human Origins and Palaeoenvironments (HOPE) research group. He was awarded his PhD in 1995 from the University of Oxford. His PhD investigated climate change and human impacts on the landscape. Adrian’s work lies at the interface between archaeology and geography/earth sciences. 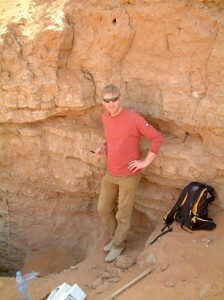 His research interests include Quaternary science, geoarchaeology, geomorphology, environmental archaeology and palaeoecology using the application of multi-proxy techniques including phytoliths, pollen and geochemistry. His work is focussed mainly in the Middle East and Arabia but also includes North Africa, Southern Africa and southern England.